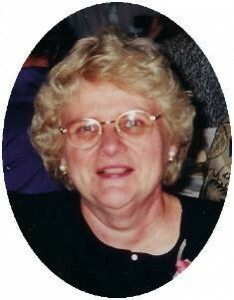 Ruth A. Mullins, 67, of Cold Springs Road in the Town of Saukville, died at her home January 21, 2006. She was born June 22, 1938 in Port Washington to Dominic and Esther Even Streff. She attended Immaculate Conception School and graduated from Port Washington High School. Before marriage she worked in the office of Simplicity Manufacturing in Port Washington. She met Thomas “Tom” Mullins of Stark, Wisconsin and they were married July 22, 1961 at Immaculate Conception Church in Saukville. Ruth was very active with her girls throughout their schooling and their activities, especially Girl Scouts. She enjoyed bowling on the Ladies league at Harbor Hills for many years. She loved to travel to where her children lived around the United States and Germany. When her children got older she took a job at Kohls Department Store in Grafton and was the Shoe Departmet Manager for over 26 years when she retired 2002. She was a lifelong member of Immaculate Conception Church. She is survived by her husband Tom of Saukville and her three daughters Ann (John) Bulka of Chandler, Arizona, Amy (Michael) Dourisboure of Bexley, Ohio, Sally (Tim) Larsen of Helendale, California. Further survived by a sister, Helen (Eugene) Hess of New Berlin, Wisconsin, other relatives and friends. Preceded by her parents and sister Dolores “Dolly” Dickmann. Fr. Karl Acker will celebrate a Memorial Mass of Christian Burial 1 pm Saturday, January 27, 2006 at Immaculate Conception Church, 145 Church Street, Saukville. Family will receive friends from 11 am – 1 pm Saturday at church. Memorials to Immaculate Conception Church appreciated.